I'm going to continue this swap until there is a lack of interest. If you missed out on the previous one here is your chance to join in. 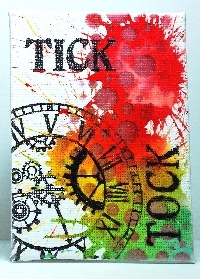 Card may be hand drawn, painted, stenciled, collaged, zentangled, embellished, use die cuts, done in fabric, etc. Senders choice. However you choose, except for "sticker slapping." Stickers may be used if they are done well, don't just stick one on a piece of card-stock and call it done. Newbies with a well filled out profile allowed (see note below). No unresolved, unexplained ones or threes in last 6 months. I check all profiles prior to assigning partners and I will ban questionable swappers. NEWBIES: Please fill out your profiles. This helps other swappers know your likes & dislikes. And you will see this is a common requirement of many swaps here on swap-bot. Although this is senders choice many swappers look at your profile to try and make something they know you would love. You wouldn't want to receive a card done in shades of orange if you hate orange! To get an idea of things to include check out other swapper's profiles. To do that; once you join this swap click the link in the box at the top right that says "view participants." Click on any name and it will take you to their profile. Any questions you can ask me in the comments below or message me. @piratecaptainmo thanks for the heads up. She has been removed from the swap. I'm sorry if this is a really stupid question, but what does one atc for two partners mean? Does that mean making two but them being the same? Apologies again if this is obvious and I'm just being silly! Hi, I joined the ATC Newbie 2, and I have received from my partners today but I dont know how to rate them or even find them here in Swapbot. I may sound silly but Im very new here in swapbot. Any help will be much appreciated. Hi, it's me again :) I kinda figured it out already. Silly me!!! Thank you. @Fabell that's okay no question is silly. @TinySleepyfox hi. Thanks for joining in. You might want to add any favorite colors you may have, any dislikes, etc. You can look at other's profiles by clicking on the "view participants" in the little box at the top right. Then just click on any name and it will take you to their page. I sent mine out yesterday, August 4th, but forgot to indicate it here. Hey y'all! I didn't realize I had successfully signed up for a swap until I got the sending reminder. Mine are in the mail, I send my partners an email right away, but haven't heard from them.